Regina, SK, October 30, 2013 – SilverBirch Hotels & Resorts is proud to announce that Geoffrey Caswell-Murphy has been hired as the new Executive Chef for Wild Sage Kitchen & Bar® at the DoubleTree by Hilton Hotel and Conference Centre Regina. Caswell-Murphy brings a diverse culinary style that celebrates the farmer-chef relationship, a philosophy that Wild Sage Kitchen & Bar® integrates into every dish. The Wild Sage Kitchen & Bar® will feature innovative and memorable food experiences prepared by Caswell-Murphy and his culinary team. The chef’s Saskatchewan-inspired food creations incorporate provincial favourites including Lake Diefenbaker trout fillet, Pine View organic chicken, and Cactus Lake beef. Other local partners include Salay Farms, Living Soil Farms, Prairie Meats, Wild West Steelhead, and Timber Creek Farm. 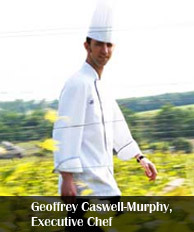 Caswell-Murphy has worked at award winning restaurants across Eastern Canada, including Cicero’s on the Water, voted top restaurant in the Halifax region in 2012. He has achieved his Certified Chef de Cuisine (CCC) Certification, which is awarded through the Canadian Culinary Institute and recognized as the highest culinary designation in Canada. Guests can enjoy Chef Caswell-Murphy’s creations when Wild Sage Kitchen & Bar® opens on November 05, 2013, along with the DoubleTree by Hilton Hotel and Conference Centre Regina. Located at 1975 Broad St. in Regina’s downtown core, the hotel features freshly renovated guestrooms boasting large and luxurious bedrooms with newly appointed showers and fixtures, and fully renovated ballrooms and meeting rooms. Reservations are now being accepted.